ANTONIO LoNIGRO and ANGELA LoNIGRO vs. JOHN C. MARTINI and ANNE MARIE MARTINI. MISC 104777 : JOHN C. MARTINI and ANNE MARIE MARTINI vs. GEORGE DAVEY and RUTH DAVEY. Miscellaneous Case #104777 involves a complaint in which the plaintiffs (hereinafter called "Martinis") seek a declaratory judgment declaring that the defendants (hereinafter called "Daveys") have acquired no rights by adverse possession in the driveway on Martinis' land, shown on a plan entitled "Certified Plot Plan in Woburn, Mass., Scale l" = 20', Mar. 5, 1980" a copy of which is attached hereto as Appendix B. [Note 2] Daveys filed an answer in effect claiming title to the driveway area shown thereon by adverse possession. Miscellaneous Case #100854 involves a complaint by the plaintiffs therein, hereinafter called "LoNigros" seeking a declaratory judgment to the effect that defendants Martinis have a four foot right of way over LoNigros' property, and that Martinis be enjoined from using an area exceeding that four feet in width as a right of way and praying for damages, costs and attorneys fees for Martinis' noncompliance with the terms of the four foot easement. The cases were tried together and will be decided together, with a judgment to issue in each case. The trial was held on February 19, 1982 at which five witnesses testified and eighteen documents were introduced into evidence, all of which are incorporated herein by reference for the purpose of any appeal. l. One Richard D. Corsetti owned some five acres of land including Lot A and Lot B as shown on Appendix A, taking title to the same about 1950 and having built a house on Lot A now owned by the LoNigros about 1957. 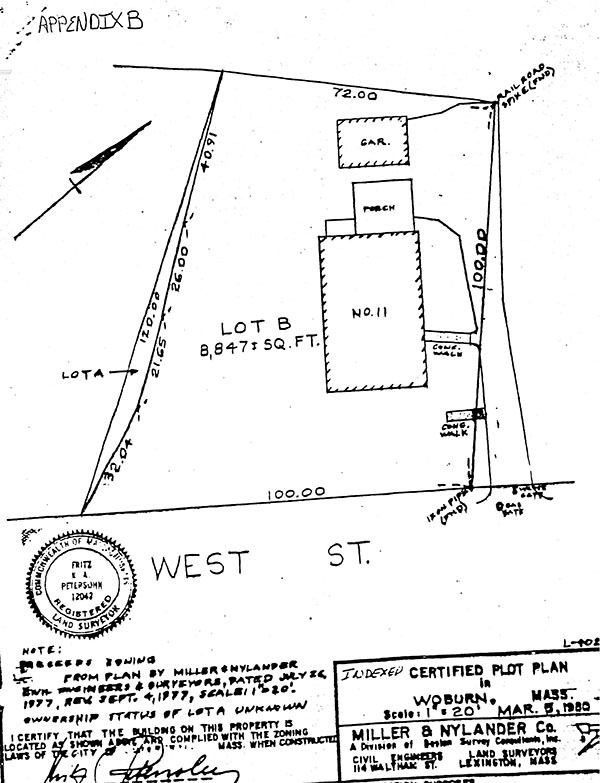 A driveway some 11 feet in width was constructed by Corsetti over that portion of Lot A shown as a strip of land running from the house to West Street, as shown on Appendix A. Said easement of way may be used for all purposes for which public streets may be used in the City of Woburn. 3. At the time of the conveyance to the Martinis the driveway to Corsetti's house on Lot A had a hot-top base eleven feet in width. The driveway went up a hill over rocky, ledgy terrain from the street to the Corsetti house on Lot A, bordered on its northwest by a small area of grass and a stone wall. On its northeast the driveway was separated from the driveway of the Daveys by an area covered with rocks and brush. The Davey's driveway is shown on Appendix A and occupies a good portion of the parcel of land marked "18.43", a part of Lot B as shown on Appendix B conveyed to Martinis by the Corsettis. 4. The Martinis built their house on Lot B in 1957 and at that time repaved the driveway to some sixteen feet in width, using in part the four foot easement obtained from Corsetti for this repaving. They had to again repave the driveway in 1964 after a sewer line was brought in, which cost seven hundred seventy dollars and was paid for by them alone. Mrs. Martini does not drive but two children who still live at home together with Mr. Martini do drive. 5. The Corsettis and the Martinis used the driveway together with the four foot easement as a community driveway, which Corsetti testified he considered it to be, from the time the Martinis built their house until the purchase of the Corsetti property by the LoNigros evidently in 1975 although the deed is not in evidence. From the time the LoNigros moved in until sometime in 1980 when the LoNigros had an attorney send a letter to the Martinis about the latters' use of more than the four foot easement, the parties used it together in apparent harmony. 6. At the time of the purchase of the house and land the LoNigros knew of the four foot easement over Lot A held by the Martinis. The LoNigros own a jeep and Mr. LoNigro plows the driveway in the winter, rakes and sweeps it and cuts the grass beyond the paved way on his land in the spring, summer and fall. There was evidence that Mr. Martini likewise did some raking and sweeping of the driveway although perhaps not to the extent of Mr. LoNigro. The Court finds that both maintain it at least to some degree and that the LoNigros had and have no real objection to the present use by the Martinis but want to stop further use when they desire. The LoNigros are determined that no rights be gained by prescription over this land and want to end any use they decide is excessive. 7. The Daveys lived on their lot on West Street from 1941 until 1950 as tenants of the owner, William L. Murphy. This lot is shown on Appendix A as "n. or f. Murphy" and on Appendix B. Mr. and Mrs. Murphy had purchased the lot from the Woburn Cooperative Bank by deed dated August 11, 1931, recorded in Book 5845, Page 160. Later it was conveyed to Mr. Murphy alone and then by him to the Daveys by deed dated June 15, 1950, recorded in Book 7593, Page 580 (Exhibit 18). 8. When the Daveys moved into the premises in 1941, they used the driveway already in existence and being used by the owners, the Murphys. The exact location of the lot line and certainly of the driveway itself was vague as shown in the photograph, Exhibit 12. As tenants this could not have been of much concern to the Daveys and never having been a problem as tenants they paid littleattention to it upon their purchase, believing it was somewhere outside the driveway and running to a point in the rear beyond some trees. 9. The Martinis showed the Daveys a plot plan when the Martinis purchased Lot B on Appendix A in 1962. As a result the Daveys removed a clothes line and an automobile parked at the rear on land of the Martinis. At the same time the Martinis informed the Daveys that their driveway was on Martinis' land but that they were free to continue using it. 10. On February 4, 1966 the Daveys received a letter, Exhibit 14, from Martinis' attorney notifying them that it appeared they were occupying part of Martinis' "18.43" strip of land shown on Appendix A. The letter further stated that the Martinis were willing for the use to continue providing that this was done with no intention of asserting any rights of adverse possession. An assent was requested from the Daveys. The Daveys did not respond to this letter nor to a similar letter, Exhibit 15, sent on January 4, 1980. 11. The Martinis planted trees now of good size at the end of the Daveys' land. The area between driveways has been planted by the Daveys with forsythia bushes. It would appear that the cesspool to the Daveys' house is somewhere in this area between driveways. Photographs introduced into evidence as Exhibits 3 through 10 show the present state of the driveways from various angles, showing the island separating the Daveys' driveway from the LoNigros' and Martinis' driveway, and showing the general rocky and ledgy terrain and the forsythia and other plantings between the driveways. Exhibit 11 and Exhibit 12 are early photos of the Daveys' driveway. 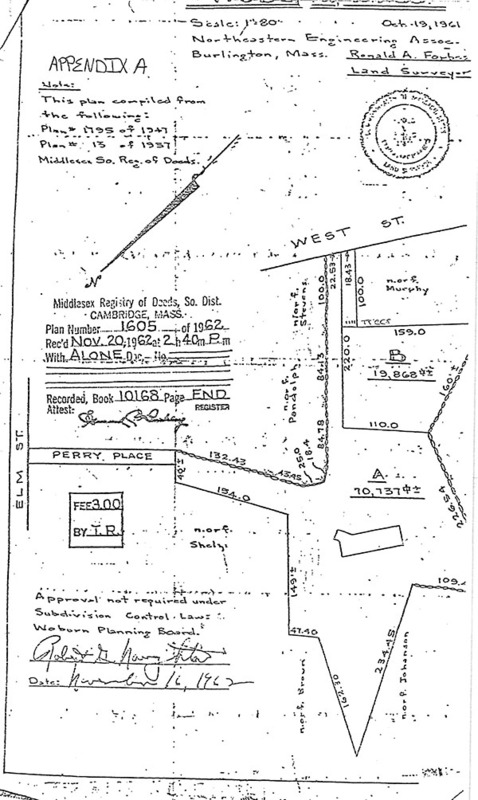 The first question to be decided is what rights if any the Daveys have in and over the driveway shown on Appendix B over land of the Martinis and on Appendix A as a strip bordering the area marked "Murphy" to its east marked "18.43" thereon. In order to establish title by adverse possession there must be proof of nonpermissive use which is actual, open, notorious, exclusive and adverse for a period of more than twenty years. Kershaw v. Zecchini, 342 Mass. 318 (1961), Ryan v. Stavros, 348 Mass. 251 (1964). One who claims title by adverse possession must prove every element of his claim and if any element is left in doubt the claimant cannot prevail. Mendonca v. Cities Service Oil, Co., 354 Mass. 323 at 326 (1968). Applying these principles to the present facts the Court finds that certainly the Daveys have used the driveway area shown on Appendix A without interruption first as tenants from 1941 until 1950 and thereafter as owners until 1962 when they were informed that the Martinis laid claim to it. They continued to use it thereafter, even after receiving attorneys' letters in 1966 and 1980. Where exactly they thought it was bounded is unclear. Probably they cared little about this as their prime concern was its use. They recognized that the Martinis owned land to the rear and moved a clothes line they had installed in this area as well as an automobile parked there. The Court has difficulty in finding that their claim was to ownership of the fee rather than to the use of the area for a driveway. Certainly the prior owner of Lots A and B, Mr. Corsetti had no idea that the Daveys' claim was to ownership. Corsetti was perfectly willing to share his driveway with all. He considered that his driveway was a community one with the Martinis. He was aware of the Daveys' driveway being on his land and was willing to share with them. It seems clear that he was sharing the use of the land with the Daveys even to allowing a cesspool to remain on his land. But, he never in the world supposed that Davey was claiming ownership to a large portion of the tongue of land conveyed later to Martini. To allow Daveys to have the fee in this lot would effectively deprive Martinis from any right of ingress or egress except over the four feet in Lot A over which he has an easement and the small area particularly at the street line remaining to the northeast of Daveys' driveway. In the case of Tucker v. Poch, 321 Mass. 321 at 324, (1947) the court stated "The rule in Massachusetts is that whenever there has been the use of an easement for twenty years unexplained, it will be presumed to be under claim of right and adverse, and will be sufficient to establish title by prescription and to authorize the presumption of a grant unless controlled or explained." To the same effect see also Bennett v. Papetsas, 6 Mass. App. Ct. 568 (1978); Bills v. Nunno, 4 Mass. App. Ct. 279 . In order to obtain the required twenty year use, if there is privity the successor can tack on to the prior use. Here, the Daveys were tenants of the Murphys who later purchased the land. They were "the successors...in both their parcel and the prescriptive use over the disputed land. On this basis the successive uses could be tacked and rights to an easement by prescription" ...would vest in the Daveys. Ryan v. Stavros, 348 Mass. 251 at 265 (1964). The Court finds and rules that the Daveys have a prescriptive right to the use of the driveway as shown on Appendix A. The next question to be decided is the rights of the Martinis over the four foot easement on land of the LoNigros. This easement is set forth in paragraph 2 herein. By its very terms it may be used for all purposes for which public streets may be used in the city of Woburn. While there was evidence of such use, certainly it allows use for ingress and egress by foot and by vehicle which is the use it has been put to by the Martinis. There is no evidence that the easement is overburdened here. Certainly the Martinis may use it in a reasonable manner which would appear to be the use made of it, this being to go to and from their house and the street with two motor vehicles, plus visits from friends. The Martinis, of course, have no right of way over any but the four foot strip set forth in the easement. They never claimed any extension by prescription or otherwise. To the extent that they are using the area beyond the four foot easement this must cease. Difficult as it may be and disfiguring as it may be to the area, it would appear that the Martinis, the most reasonable party of the group and the one who has put funds and thought into the aesthetics of the area, must be the ones to suffer by having to extend the driveway over land of theirs of rocky nature possibly by blasting and otherwise. Under the circumstances they should be allowed time in which to do this. The Court has been shown no damages for Martinis's use of more than the four foot way. This use was completely permissive until the LoNigros had their attorney write to the Martinis in 1980 and since then would still appear to have been permissive to the present. The Court believes that under these circumstances it is only fair to grant the Martinis a reasonable time to make other arrangements for ingress and egress to their property. The Court believes that these arrangements should be made within one hundred and twenty days of final judgment herein. [Note 1] Appendix A is a copy of the pertinent portions of a plan attached to Exhibit I and recorded in Book 10168, Page End. [Note 2] Appendix B is a copy of a plan of Daveys Lot introduced into evidence as Exhibit 13. [Note 3] Any references to instruments recorded will be to the said Middlesex County South District Registry of Deeds.